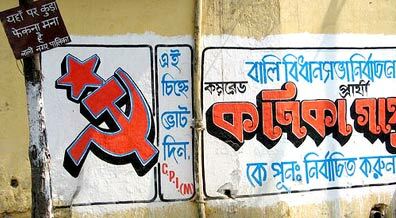 The Political Bureau of the Communist Party of India (Marxist) has hailed the State election results in West Bengal and Kerala as a "splendid victory". The election results have strengthened the role of the Left in national politics. India is divided into 26 states with groups of states holding State elections at different times. National elections are held across the whole country once each four years. On this occasion State elections were held in West Bengal, Kerala, Tamilnadu and in Assam. In West Bengal, the Left Front has been returned to office for the seventh time in succession, a record unmatched in the country. This time, the Left Front has won a three-quarters majority, claiming 235 of the 294 seats. The CPI(M) alone won over half the seats in the State. The Left Front is made up of the Communist Party of India (Marxist) the Communist Party of India, the Forward bloc and the Revolutionary Socialist Party.. This election has, once and for all, exploded the pernicious propaganda that the CPI(M) and the Left Front win elections by "scientific rigging", given the fact that the extraordinary measures taken by the Election Commission were hailed by the opposition. In the State of Kerala the people have voted decisively to bring the LDF into the government and rejected the Congress-led United Democratic Front (UDF). The Left Democratic Front has won a two-thirds majority claiming 98 out of 140 seats. This is an endorsement of the Left and democratic platform and an indictment of the five years of the UDF misrule, said the CPI(M) statement. In the state of Tamilnadu the voters elected the DMK-led Democratic Progressive Alliance. The CPI(M), which had an electoral understanding with the DMK-led alliance, has won nine seats, up from six. In Assam, the Congress, which was in government, has failed to win a majority although it emerged as the single largest party. The CPI(M) won two seats whereas previously it held none. India is divided into 28 states and not 26. And national elections are held once in every 5 years. What's Ken Shirley up to These Days? W.A.Y.N.C.R? Number 8, Helen Te Hira. "Two Windows on the Socialist Future"
Dave Henderson's Tax Battle to be Filmed.